March 10, 2016 January 2, 2017 / Elizabeth T.
I don’t know what it is lately, but I’ve been a little obsessed with the sporty chic, athleisure style in general. I’m loving how comfortable yet stylish all of these workout-inspired items are, and the casual pieces fit really well into my usual wardrobe, allowing me to create a variety of effortlessly chic ensembles. One of my recent favorite purchases is this ribbed crop top from Forever 21. I’ve never been much of a crop top fan until last year (I know, I’m a little late to the party, right? ), but ever since I started last summer, I can’t seem to get enough of them! 🙂 They’re just so comfortable yet chic at the same time, and I love how great they look both dressed up or down. Crafted from a lightweight ribbed knit, this crop top is different from your normal midriff-baring blouse because it features an asymmetrical cut hem that really does such a great job of highlighting the waistline. Rather than dressing it up, I decided to play up my recent obsession with the athleisure style and paired it with a pair of fleece leggings. I love the vertical stripes that run down the leg because it really helps to streamline the silhouette, making them go on for days. This look is perfect for a little session at the gym, and by tying a plaid shirt around the waist, the ensemble can even work for a day out with friends. That’s what I love the most about the sporty, athleisure look – the ensembles are not only workout-friendly, they’re extremely stylish and perfect for going out in! And of course, to finish off the look, I paired them with my Nikes and my current favorite pair of sunnies from French eyewear brand, Polette. If you haven’t heard about Polette, they’re an online optician, offering designer frames from $6.99 to $49.99, and lenses from $9.99 to $75! 🙂 They’re definitely one of my new faves, so if you’re looking for a pair of glasses, be sure to check out all of their stylish frames! And that’s all! I’ll be announcing the winner in a week, so please stay tuned! 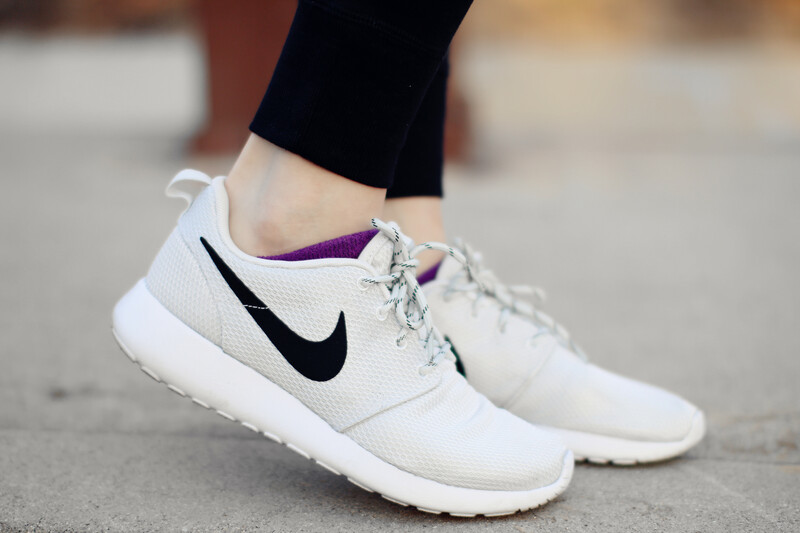 Are you all fans of the sporty chic/athleisure look? 🙂 Would you wear an outfit like this to go out in? Let me know if the comments! 🙂 Hope you all enjoyed this look! No wonder you like this sporty style so much, it suits you like a glove! Thank you so much Laura ❤ 🙂 Hehehe glad you liked it! you look edgy! i’ve never been much a crop top fan either, it makes my tummy chilly and then i’ll catch a cold hahaha. love a good sporty cool look, you look great! In love with that crop top.. great look! I think your blog is lovely, let me know if you would like to follow each other! Love your outfit! You look so chic! Ahh! Body goals, ootd goals, everything goals! Hahaha aww you’re too sweet Grace ❤ 🙂 Thank you so much for stopping by love, and hope you're having a wonderful weekend! Love the crop top and the nike sneaker! I love that this crop top is a little more interesting than usual. I also LOVE your sneakers and leggings (one can never have too many leggings if you ask me). Hehehe me too 🙂 The asymmetrical hem is what attracted me at first ❤ And I definitely agree Pia – a girl really can't have too many leggings hehehe! Thank you so much for stopping by! I’m never much of a fan of sporty chic for myself but it always looks good on other people lol. F21 does have good products sometimes; you should’ve let me know you’re buying from there so I could make use of my discounts! only if i had flat belly like yours! hehe love this style elizabeth, i’ve always enjoyed pairing my outfit with some nice kicks! i’m all about comfort and this outfit idea is purrrrfect! Hahaha I’m sure you do too Annie 🙂 And yes, I’ve been obsessed with sneakers for a while now ❤ Hehehe comfort is always key! Thank you so much for your kind words! Haha I never really used to like them either, Tiffany, but after I tried it, I really started liking how comfortable they are ❤ 🙂 Wishing you a great week ahead! Love this sporty chic look! Super cute! Thank you so much Jane! 🙂 You’re too kind! You are adorable and cutes sunnies. Thanks for sharing and we look forward to seeing you over at Eye See Euphoria. Always killin’ it Elizabeth! ❤ I personally love this sporty chic look & wish I could pull it off all the time haha. Hope you're having a great week lovely! Haha aww you’re too sweet Lynna ❤ 🙂 Thank you! And I'm sure you could definitely pull off this sporty chic look too! Hehe it's so comfortable to wear! Wishing you a great week too, love!